Full width magnetic clamp allows precise sample positioning with secure grip. 12.7mm thick float glass platform large enough for direct A to B comparisons or evaluation of machine caused treatment variations. The 305mm x 305mm smoothing pad with closely controlled compressibility is engineered to promote uniform fluid distribution with minimal squirm. Each unit is meticulously inspected to assure flatness. Ideal for use with “DyneX” applicators. Five pre-adjusted shock absorbing levelling feet and surface mounted spirit level ensure precise levelling and firm footing. Liquid crystal thermometer is accurate to better than 1°C. Applies a highly uniform wet film coating.These wire-wound metering rods, when used on a precision surface such as the “DyneX” Drawdown Platform, will apply a highly uniform wet film thickness, which is ideal for Dyne testing. The rods, widely known as Metering Rods, Mayer Rods or drawdown bars are fabricated from 303 stainless steel; the wire winding is 304 stainless steel. The 400mm long “Mayer” rod has 305mm of wire wound on centre. Rods are available in 6.3mm and 12.7mm diameters. These lab rods or drawdown bars can be used either to test two coatings simultaneously, or for full width substrate evaluations using one test liquid. Economical and easy to use; simple clean-up with water, alcohol, appropriate solvent and low lint cloths. With the use of such non-abrasive cleaners, metering rods can be reused repeatedly. See the Metering Rod Selection Chart PDF below for further information. With a Teflon® coated surface it is ideal for Dyne testing – no attraction to, or contamination from the applicator affects test results. Remarkably fast and easy clean-up saves time and cleaning supplies. The “DyneX” applicator measures only 13 x 13 x 64mm. A precision ground gate, 38mm wide, is centered on each of the four edges. This restricted passage channels the flow of the Dyne fluid through the gate whilst limiting the wet film thickness applied to a maximum of only 12.5 microns. This tool can produce high quality drawdowns in a confined area, making direct benchtop testing a reality. 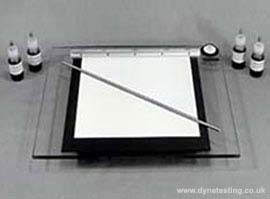 For best results, we strongly suggest use on a “DyneX” drawdown platform. All four gates are precision ground to the same clearance to facilitate quicker test-to-test turnaround, and to provide the longest service life. Packed in a cushioned protective container. 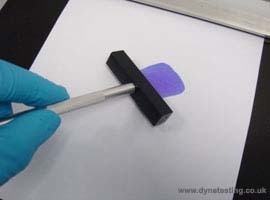 To perform the Dyne test with a “DyneX” applicator, first apply a short bead of surface tension test fluid from a dropper bottle directly to the sample surface. As soon as possible, the applicator is then drawn down over this bead, spreading it over the surface. 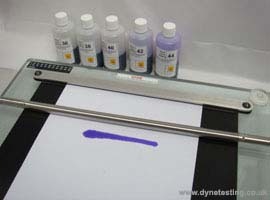 Determination of Dyne level by wetting is then performed to a standardised test procedure.